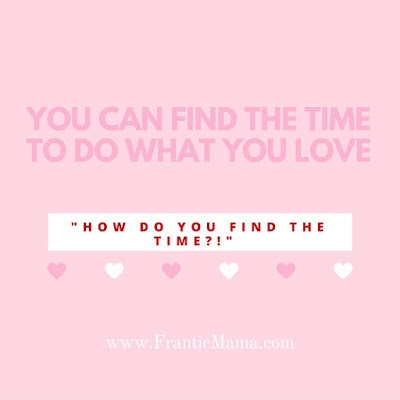 Frantic Mama: "How do you find the time?!" The number one question people ask when they find out I'm a freelance writer and blogger is an incredulous, "How do you have the time?" Like many of the people who ask this, I have busy little children, now ages 3 and 5, at my feet. 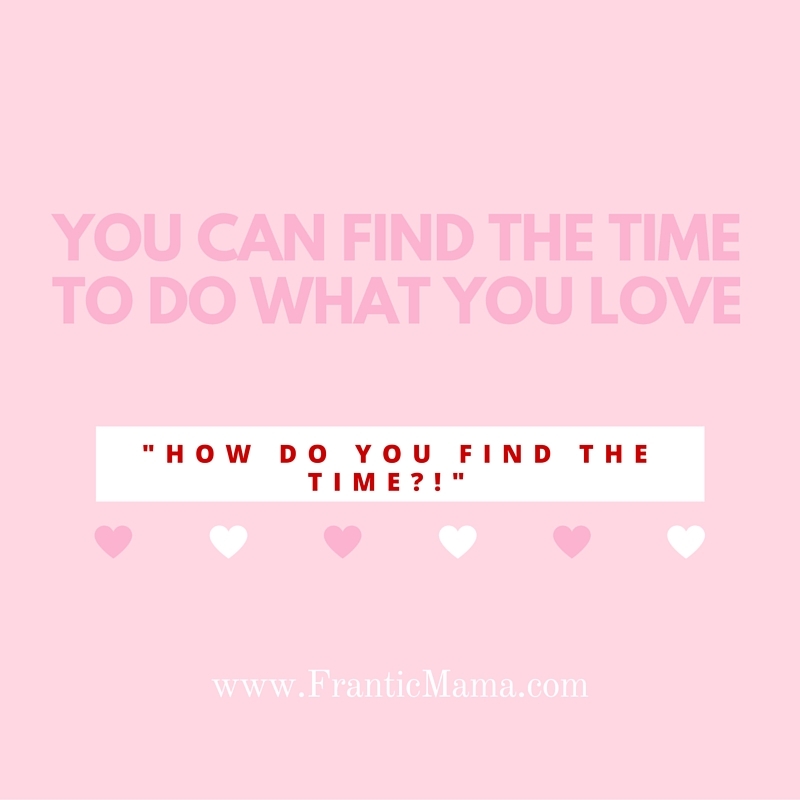 So I do understand where this question originates-- it's hard to wrap your head around the idea of getting anything done when you have children or babies who are in constant need of attention! It's really hard. I know this. I've been there. I am there. I try not to be offended by this question, as I hope it comes from interest rather than judgement along the lines of, "she must have a full-time nanny!" "she lucked out!" "she must have it easy!" Those types of rationalizations. None of those are true for me. It's not luck. I don't have full-time help. I'm not drowning in excess alone time. Here is how I find time to write: I just do. You know how some people find time to work out? Others find time to go out to dinner or book club? Others regularly get their hair done, make crafts, or go to Yoga? They find time to do those things. That's great. I like those things too, but I make more time to write because I love it and I have to. I do not scrub my house with any free time I muster. I do not constantly sign up for playdates, book clubs, or social outings. I sure as heck don't spend precious alone time talking on the phone or sweating it out at a gym. Those are choices and priorities I make in order to have room for my biggest passions. I wake up early to write. I write after my kids go to sleep. If my husband takes them out for lunch to McDonald's on a Saturday (I try not to feel guilty), and I high-tail it to my laptop. If school overlaps for my kids? You can be 90% certain I'm sitting on my big yellow couch writing. Huge chunks of free time are rare for me too, so I work efficiently and squeeze in 10 minutes here, 20 minutes there. I think that might be key: you can get more done than you think in half an hour. You have to chip away at it. There's also something to the old maxim, "hard work pays off." I did not magically wake up and get published and paid for my work. I have been blogging since 2011, and writing since... well, as soon as I could hold a pencil. I network. I write. I read. I write. I promote. I write. It is work. Work I love to do, but it's most certainly work. Here's my point: If there is something you want to do, that you feel like you need to do, then you need to do it. Something else I love to do: Riding! I make time. "But I really don't have the time!" you think, exasperated with me. I'll admit, for some readers, that may be true for now-- perhaps you have a hungry newborn and a toddler who no longer naps at home with you all day, or you are raising young children by yourself, or your spouse is deployed. You are exempt and in my thoughts! Be patient with yourself. I'm addressing well-meaning people whose lifestyles are similar to mine who tell me that they would like to take up X/Y/Z but can't find the time. For many people, it means not committing yourself to things that don't matter as much for you in the long run-- volunteering at all of the preschool class parties (I don't do those), cleaning the bathtubs all the time (are you kidding me? ), making meals from scratch (thank you Trader Joe's! ), letting kids stay up late (no thanks! ), driving 30 minutes to do XYZ when you don't need to (I hate highways). It means waking up earlier, or working after the kids are in bed. It means skipping the epic Costco run so you can work on your XYZ project for 30 minutes, and it means working on your laptop while your kids watch a movie... the list goes on. Prioritizing is crucial when you have so little time to yourself. The time you have devoted to your painting and writing seems so much more worth it in the long run than a perfectly sterilized bathroom, doesn't it? Don't let other people make you feel bad for it. A creative life is a wonderful life! :) Other people don't always understand that, and it is hard for me too when I get the sense they feel what I do is silly/waste of time, etc. Thank you so much for your kind words! This is wonderful advice. Prioritizing is the key isn't it? So much gobbledygook that doesn't need to be done. That same gobbledygook will still be there so sweep it under the bed for later and take the time to do what you enjoy. Everyone in the family benefits! LOL! "so much gobbledygook." Yes! It doesn't really matter in the long run if my stairs are dusty or there are two days worth of crumbs under my table; it's way better to publish an article, take a piano lesson, or paint a picture than to constantly toil away on chores. Oh! I just came back to say Gobbledygook is such lovely lively word! Ha ha! !